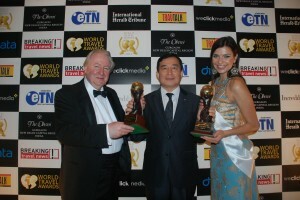 Seoul, Korea, 2012-12-27 — /travelprnews.com/ — Korean Air, last night 12 December, received the honour of being awarded two prestigious accolades at the World Travel Awards (WTA) Grand Final Ceremony 2012, held in New Delhi, India. The airline was named the World’s Most Innovative Airline and was also recognised with the World’s Excellence in Service award; a highly competitive category with a nominee shortlist that encompassed high profile luxury brands from across the travel industry, including some very impressive hotels. Voted for by travel and tourism professionals worldwide, the World Travel Awards represents the ultimate achievement, recognised globally as the foremost acknowledgement of excellence in product and services. The evening marks the culmination of a year-long search for the very best travel and tourism brands in the world, and awarded the winners from WTA’s regional heats. Korean Air is the first airline to be awarded ‘World’s Excellence in Service’ since the prestigious category was introduced by the World Travel Awards in 2010 and past winners include luxury companies within the hospitality sector. This achievement marks the airline’s goal of exceeding expectations and achieving ‘excellence in flight’. In November, Korean Air introduced new in-flight dining options for passengers, which showcased the flavours of traditional Korean cuisine. The airline also became the world’s first airline to serve Ghost Block Single Vineyard Cabernet Sauvignon, a variety that has recently been highly commended by noted wine critic, Robert Parker. These new offerings mark an ongoing investment by Korean Air to develop and present unforgettable meal experiences. New this year, Korean Air installed a state-of-the-art AVOD (Audio Video On Demand) service on its A380 superjumbos and B777-200ER aircraft. These systems provide passengers travelling on long haul flights, with a plethora of entertaining programmes and applications operated by a touchscreen display. Since it was introduced into Korean Air’s fleet in 2011, the A380 continues to offer an innovative way of travelling in style and comfort. Korean Air became the first airline to devote an entire upper deck to ‘Prestige’ business class seats and its onboard Celestial Bar and Duty Free Showcase continue to provide travellers with the ultimate in luxury experiences. This entry was posted in Airlines, Airports, Business, Flights, Luxury, Tourism, Travel, Travel Awards, Travel Marketing, Travel Services, Travelers. Bookmark the permalink.